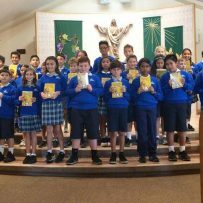 At Mass this morning we celebrated our 5th grade bible ceremony. Our pastor, Fr. Chris Bransfield, blessed the 5th graders and their new bibles. The students will keep these bibles at school each year through middle school to use in religion class. Fr. Chris challenged the students to open their bibles often to read the word of God and put those words into action. This special ceremony is a tradition the 5th graders look forward to every year.